A great read (and listen) for the start of 2013! – Play UBass! A great read (and listen) for the start of 2013! We’ll kick this year of with a 16 year old article in Bass Player back in 1997! Why, you might think? Well, it’s a really good one. 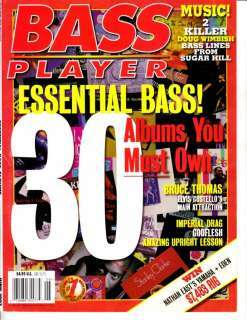 The Bass Player Staff (in 1997) did a compilation of these 30 must have essential bass recordings! Of cause there have been quite a few new albums released since 1997 but these 30 is still a great start if you want to get some inspiration and a bit of a history check to kick of 2013! Link to the article – Download as PDF! You can read more about influential bass lines in a previous post. < Happy New UBass Year! Thank you, Magnus. Most interesting.